Haisam Elsharkawi is a US citizen of Egyptian descent who was travelling to Mecca in 2017 when he was pulled out the boarding line for his flight from LAX by CBP agents who demanded that he unlock his phones; when he refused and asked for a lawyer, he was handcuffed and taken to an interrogation room where he was questioned and bullied until he unlocked his phones; the CBP officers spent 15 minutes paging through his emails, making snarky remarks about his Amazon purchase history and how many unread emails he had, and then let him go. He missed his flight and was not offered rebooking by Turkish Airlines. The CBP did not have a warrant to conduct the search. Elsharkawi is suing the CBP. He's seeking damages and an order that the CBP will not conduct searches in this manner in the future. Elsharkawi is now suing the US government, the Secretary of Homeland Security Kirstjen Nielsen, CBP commissioner Kevin McAleenan, and four of the agents who questioned him in 2017, seeking damages and an order that would prevent the government from performing this kind of search in the future. He and his lawyers argue that CBP and DHS violated the First Amendment, which protects religious freedom and freedom of speech, because his phone contained “expressive content and associational information.” His lawsuit also argues that they breached the Fourth Amendment, which bars unreasonable searches and seizures, and the Fifth Amendment, which protects against self-incrimination. 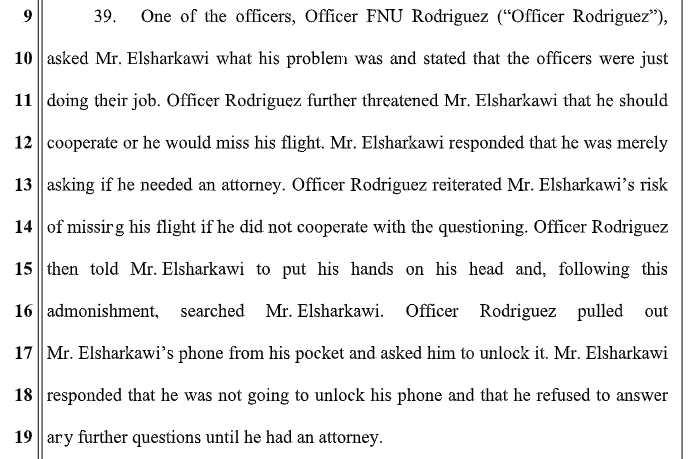 “The search of Mr. Elsharkawi’s phone was not supported by any real suspicion of ongoing or imminent criminal activity and as such no basis for a search existed,” Elsharkawi’s lawyers, who defined the incident as “outrageous,” argued in the complaint.